Visually pleasing, packed with helpful information and fun to read, The Way of the Belly is a grand exploration into the world of beauty, health, and happiness. This 173-page reader is a treasure cove for those interested in being inspired by two of the nation’s leading dancers and sensual gurus, Neena & Veena. As identical twins, they are a force times two in every way. Their styles are similar but offer a slightly different point of view. The book is one of the best bargains available at only $24.95. Bursting with recipes that make your mouth water, easy to read side bars with tips of the trade and classy visuals that show you what the text explains in detail, it’s hard to beat the value. 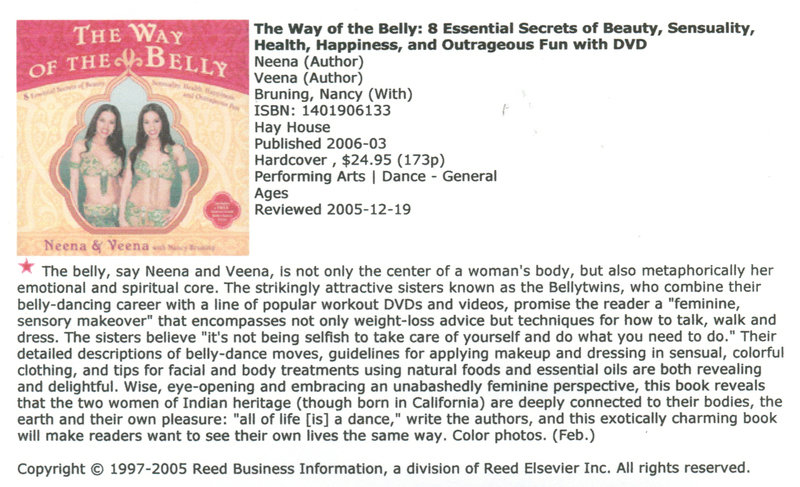 Additionally, The Way of the Belly offers a free instructional Belly Dance DVD with the book! It’s obvious the Belly Twins are more interested in educating others about the dance than counting their dollars made by their books’ sales. The Way of the Belly and the Belly Twins are a breath of fresh air in the industry of dance and fitness. I strongly recommend this to brides looking for fun fitness to slim out before their weddings, wives looking to spice up their romantic side, anyone interested in fitness and mostly to those who seek creative ways to health and happiness. These fitness leaders are heading for almost guaranteed global stardom. This is definitely a great workout. It has everything from toning your arms, abs, hips, buns, and thighs. They incorporate belly dance as well, like snake arms, and shimmies. Since I’ve been bellydancing for a while I feel it’s great practice for me. If you have never bellydanced it will be fun to shimmy the first time. Don’t expect it to be a ALL bellydance routine, it has several exercises that are meant to workout different muscle groups. The whole DVD is about 70 minutes long, so if you don’t have time to do the whole workout, skip to the abs or cardio. They have stretching in the end as well. I think its a great overall workout and I do recommend it to anyone who wants to get results overall. If you’re looking for a workout that incorporates bellydance, this is a good one. It includes a warm-up and cool-down. I like the format. Veena and Neena perform the moves on a set that’s not too distracting. You really will use bellydance moves while getting a great workout. This is perfect for someone who wants a workout that’s not too boring but which doesn’t require you to learn a bunch of unnecessary moves. Veena leads the dance section and Neena leads the weight section, then they switch off. The music is upbeat and fits really well. If you’d like a blended core workout that’s not too typical, this is it. I’m glad I got it. I would certainly be willing to purchase more just like it if they were available.Note: This DVD also includes a bonus dance by Veena and Neena together. It’s always fun to see them perform. I just wish the video editor hadn’t decided their performance needed to be “spiced” up by popping in and out of a monochrome sepia tone. What was the point of that, I wonder? Some people have zero sense of what’s appropriate. Just let Veena and Neena show their skill in full color and leave it alone. This is for the women who love to bellydance, and don’t like to do boring exercises like lunges, over and over until you are sick of them. I definitely feel like I worked out when I was done, even though I’ve been bellydancing for 5-6 year now. The Bellytwins fitness videos are the reason why I lost weight before, and I’m hoping to do it again adding this video, because I had a period of “lazy time” due to my foot pain all the time. In this video, you will use light weights to work your arms, do quite a bit of shimmying, and doing bellydance moves to work your body out, it’s cardio, with some light weight lifting for you arms. So if you love to bellydance, and if you want to lose weight, and if you don’t like lunges, then I would recommend this for you. Especially if you are a fan of the Bellytwins fitness series of dvds. Neena and Veena are fabulous instructors. There are three videos included: Basic Dance, Beyond Basic Dance, and Mystic Dance. If you are deciding between VHS and DVD, I strongly recommend the DVD. The DVD has some great bellydancing extras on it, including some fitness bellydance examples. You can choose having the instructional voice on or off. My one complaint about these videos revolves around the instructional voice, which is not always in sync with what Neena and Veena are currently doing. If I’m not paying attention, when I’m learning the steps, I can get frustrated by that, as I tend to listen to the voice more. (habit left from dancing and aerobics) I LOVE the videos. These are the best bellydance instructional videos I’ve tried. The camera focus is almost perfect – when small movements are occurring (say with the wrist), it’s focussed on the wrist, or if there is a bit of trickier footwork – focus is on the the feet. Otherwise, it’s mostly a whole body shot – which is much better than many of the other bellydancing videos. Instruction starts slow – I like how they teach arm positions for you to be able to experiment. The progression from slow to tempo does occur a little fast, but it’s allowed me more enjoyment of the video because it has been a little more challenging. It’s not too difficult! The steps all come together in the end with a choreographed dance, which is great fun. The videos definitely build skills from one to the other. Once you’ve practiced a few times, and are getting the dance routines down, you will be getting a workout!! My arms already look totally different, and I have more hip flexibility than I use to. These videos gave me enough experience to feel confident enough after three weeks of (secret) practice to give a dance to my husband. He thought I’d been taking lessons on my lunch break. (and no, he’s not suave enough to have just come up with that!) Fun and energizing exercise, with an element of sensuality – for what more could I ask? As a bellydancer for over 10 years, I was happy to find this set. It seems that this art is becoming popular, and so there are many instructional dvds out there now, you will notice the release dates are all pretty new! Anyway, these two know how to teach well, and they are great! I learned a few new things, and it is a fun workout as well. Get this one if you really want to learn bellydance. I purchased the DVD set (not having ready any reviews) wanting to learn something new, have fun doing some sort of exercise, spice up my sensuality, and really to try to bring my body back to some sort of shape four months after giving childbirth. I WAS NOT DISAPPOINTED! I really enjoy this DVD set. The lessons are fun to learn with several movements much easier to learn that I thought they would be (like shoulder shakes and body shimmies) I didn’t feel like any of the moves were impossible to master. You’re working out while you’re learning and having fun at the same time. One bonus for me is that my four month old son enjoys watching lovely Veena and Neena dance while I follow along (looking silly right now). So I can get in my physical activity without waiting for him to nap. I look forward to the time I can show my new talent to my husband, which I have no doubt he will enjoy. Until then I’m going to keep practicing, practicing, practicing, with Veena and Neena. The extra dance videos are fun to watch and really get your imagination going. They show the different forms of belly dancing there are out there. The costumes are lovely (and inspiring)and so are the ladies performing them. I’ve gotten several good ideas as to the type of costume I would like to make for myself. If you decide that to buy this DVD set, I doubt you’ll be disappointed. It’s fun, lovely, and tastefully done. I AM THIN AND BELLY BEAUTIFUL! I HIGHLY recomend Veena and Neena’s “slim down”. When I started this program it was in December of 2002. I was 60 pounds overweight and becoming deeply depressed because of it. I actually picked up Veena and Neena’s “fat burning” VHS tape and having enjoyed the tape so much I bought “slim down” soon after. As soon as I started “slim down” I enjoyed it even more than “fat burning” and stuck with it. At first I started out small and did the tape once or twice a week. Febuary I started doing it at least three times a week. I lost 15 pounds before April. Starting in May I switched to a Low carb diet, cut out sugar drinks and drank LOTS of water. I kept up my workout ritual with the belly-twins and did the video four to five times a week. Between April and August I’ve lost about 35 pounds. A total of 50 lbs! I’ve gained beautiful muscle, I’m toned and I’ve only got a short way to go till I reach my goal weight! Veena and Neena’s program has inspired me to take bellydancing classes. This DVD is a work out video (not a dance instruction video) and it will take a little time to learn the moves. Learning the moves doesn’t take away from the intensity of the workout though. As soon as you familiarize yourself with the moves I promise you’ll love it! If you want to learn the dance itself I suggest Veena and Neena’s other DVD’s and tapes “Mystic Dance” “basic dance” and “beyond basic dance”. The workout videos do however use bellydance moves for the workout. I own all their programs and out of all of them “slim down” has helped me the most. I am currently trying to get back into shape after not exercising for about three years. Because of this, I find that I have to stick to lower impact videos. I bought Bellydance for Beginners-Fat Burning on a whim over Christmas and have since purchased both Basic Moves and this video. Though I enjoy all of them this one is my favorite by far. Visually, it’s a little bit glitzier than the others. The set is the same room but colorful drapes and pillows have been added to decorate it so it doesn’t look like a big empty room anymore. Also the country “landscape” has changed to something like a city at night. The girl’s costumes have also changed for the better to shinier fabrics and more fancy hip scarves. The music is much better as well — sassier and more energetic! I was surprised however that the choregraphed dances during the credits have been removed and replaced with a montage of 30 sec clips of the twins dancing! Workout wise, this is FUN! The thirty minutes absolutely fly by. This video is much more of a cardiovascular workout than any of the others. You “genie bounce” in between the various toning moves(it’s a bouncy way of stepping side to side.) There’s quite a bit of jumping and hopping throughout and this video gets my heart racing more than any of the others did. Part of this is because the moves are pretty FAST. I recommend starting out with the Basic Moves video first in order to learn the movements at a slower pace. (However, this is not necessary, if you don’t want to buy both — just rewind…) Like all of the videos, this one is full of fun and fluid, sensual movements. I always end up with tight shoulders and hips from the video. The workout seems to mostly target the waist, hips/gluts, and some abs although your entire body gets to move around throughout. It is a good overall workout. I find myself doing the moves along to the music in my head throughout the day after I have done the workout. Veena and Neena videos are always great productions and rarely have any distracting close-ups that prevent you from seeing what you should be doing. The twins are skilled dancers and very inspiring to watch. One of the best influences of the videos for me is that I have become more aware of the many ways my body (which I have always thought of as very rigid) can move. Yes, my ribcage can move seperately from my hips! Although i may still be a bit klutzy, i am gradually becoming able to move in the sensual ways I always wanted to.